Newlywed Hannah Swensen Barton (Wedding Cake Murder, 2016, etc.) 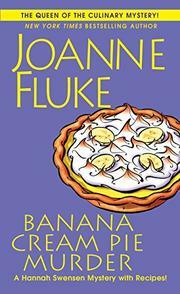 is disconcerted to find that her husband Ross’ favorite dessert is a clue in a murder investigation. Hannah is barely off the honeymoon cruise ship when her mother breaks disturbing news: after hearing some anguished screams, Delores has found downstairs neighbor Victoria Bascomb dead on the floor of her living room. A banana cream pie and two dessert plates laid out on the actress’s coffee table suggest that Tori must have known her killer. Could it be her brother, Richard, Lake Eden’s philandering mayor? Or Tricia Barthel, one of the students who come to Tori’s apartment for acting lessons? Could Tori’s shifty New York business manager have done her in? Or one of the Lake Eden Players whose Thanksgiving production she was directing? Each time Hannah has an idea who did it, her suspect produces an alibi. Her sister Michelle moves into Hannah’s spare room and agrees to direct the play in Tori’s place; Michelle agrees to help out at The Cookie Jar while Hannah spends her days sleuthing; and Hannah’s partner, Lisa, keeps customers entertained by acting out the murder scene. But with leads disappearing as fast as her Cheery Cherry Cookies, Hannah’s almost tempted to turn the whole investigation over to her ex-boyfriend Detective Mike Kingston and go back to making Pumpkin Scones with Sugared Cinnamon Glaze. Baking maven Fluke wants to have her cake and eat it too. Grafting Hannah’s new relationship with Ross onto her lingering attachment to two previous boyfriends, her family of origin, her business, and the rest of the Lake Eden crew leaves precious little room for mystery.